With the booming food and beverages industry in Singapore, Tapas is becoming increasingly popular amongst its people. It is not easy to spot a good Tapas restaurant in Singapore but La Viva is one of the few dining options that serves authentic Spanish dishes to savory contentment. Located in the heart of the city at Chijmes, the Diagon-Alley-risque style avenue is a perfect spot for chilling couples and friends to hang out for drinks and food - they offer alfresco and indoor dining. La Viva offers one of the most extensive range of Sangria, a wine punch typical of Spain, Portugal and Argentina. 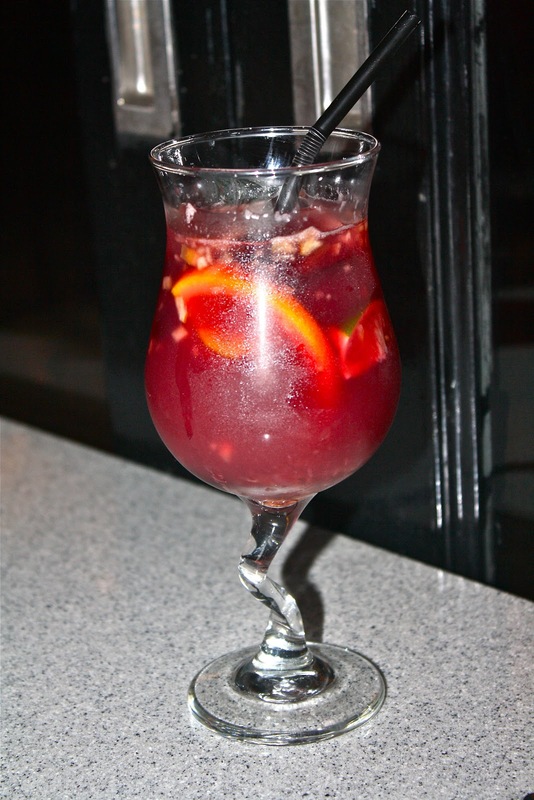 In this case, since La Viva is Spanish, so we are referring to Spanish Sangria. The different kinds of Sangria include the typical Spanish Red Sangria, as well as fruity options such as apple, strawberry, cranberry. We had the La Viva Red, which had bits of finely diced apples in it but my partner didn't take fancy to it due to its intensity from the red wine. 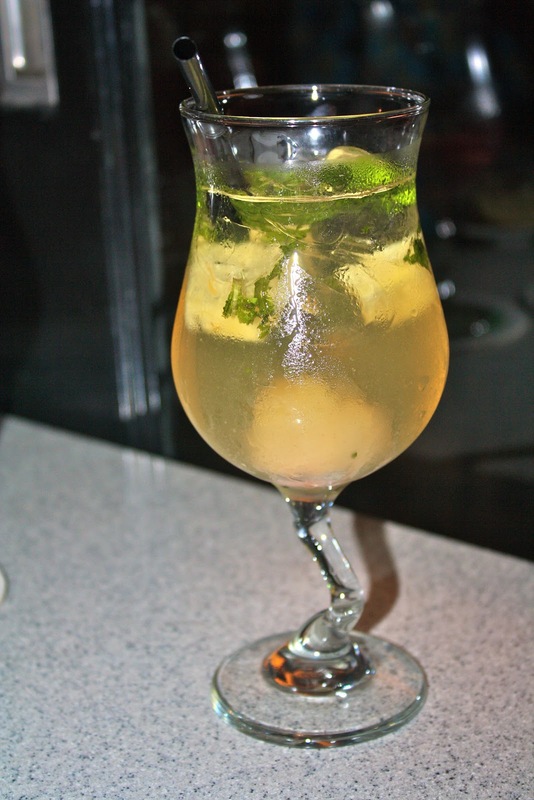 However, the Tropical Sangria with fresh pineapples, lychee and fresh mint leaves was a lot more quirky and out of the ordinary. I'll recommend the latter more. One of the most common gastronomic speciality you can find all over Spain - Tortilla Espanola. Egg lovers will find that the traditional Spanish omelette is compact in texture and the bits of potato dices in it makes the dish very filling. It is minimally seasoned which brings out the taste of the main ingredient - eggs. The next we tried was the Cangrejo y Calleta. The fancy name simply translates to chili crabmeat on a cracker. The flossy crabmeat is doused in spiciness and robust in flavors especially since it is specially seasoned in house. However, the downside is that you can tell that the crabmeat came from a can within your first mouthful. The fancy names does not stop there. We were recommended the Albondigas con Tomate which were pork and beef meatballs topped with homemade tomato sauce. The meatballs were cooked medium and i was expecting them to come out dry due to its size (yes, they were quite huge). Fortunately, they turned out perfectly cooked and the tangy homemade tomato sauce gave it that extra zest. We were also served with the Croqueta de Pollo. Unlike normal croquettes, we were told that there was no potatoes in this one, rather it is a mix of cheese and minced chicken. However, both my partner and i could not taste any of that. Perhaps it is due to the extra savory garlic mayonnaise to that effect. Nonetheless, the crispy croquettes were a delight. One of my favorite dishes at La Viva is the Potatoes y Chorizo. The potatoes tossed with paprika (one of my favorite spices), chorizo slices and onions were beyond amazing. The chorizos were slightly salty but the potatoes eventually evened the saltiness out when eaten together. For those who don't like potatoes, you should try the Chorizo con Ajo y Vino. This simple dish of chorizo with garlic and wine, which was simply quite delish on its own. We had it with the Goat Cheese, which took the chorizos to a whole new level. However, the Goat Cheese on its own didn't really leave an impression. Unlike the French version, the Spanish cheese is harder but less pungent. The last of Tapas we had was the Necora Frito. The deep fried soft shell crab however, didn't impress. The batter could have been crispier and the cocktail dressing accompaniment tasted a bit like our regular thousand island dressing. The crab wasn't as meaty as i expected it to be as well, but if you enjoy sinking your teeth into crispy stuff and hearing the sound of crunch, you really can't fault this dish. of clam, salmon, squid, prawn and mussels. All ingredients are fresh and the zest of lemon really brings out the freshness to flavor. The rice is well-managed - not too overcooked or moist and the imperfect charred bits of the rice bring the dish to savor. For desserts, we had the Mango Creme Brulee and the Caramel Custard. Mango Creme Brulee came as a delight especially since it is made in the house with fresh pureed mangoes (you can actually taste the fibre) which was rich in flavor and does not taste artificial at all. The Caramel Custard, however, was a little more of a letdown because it was not sweet enough in our opinion. However, certain people may acquire the taste since the egg white in this custard is brought out more prominently as a result. The raspberry, blueberry and strawberry were fresh and sweet to munch on. In all, the food at La Viva pretty much made the mark. Service was also excellent with our plates being changed in between a few dishes. The only turn off will have to be the parking at Chijmes, which will ironically set you back by $10 per entry - this is more expensive than an average plate of Tapas at La Viva. Prices at La Viva are generally reasonable (like what i mentioned earlier in comparison to the parking charges) and for the quality of food they serve, i'll gladly be back for more when my Tapas craving hits me again.